I needed a peaceful and local day at a pond; and where better than at Cadnam Common where my interest began all those years ago. A stiff breeze tempered the heat and was potentially perfect for some marvelous aerobatics.. 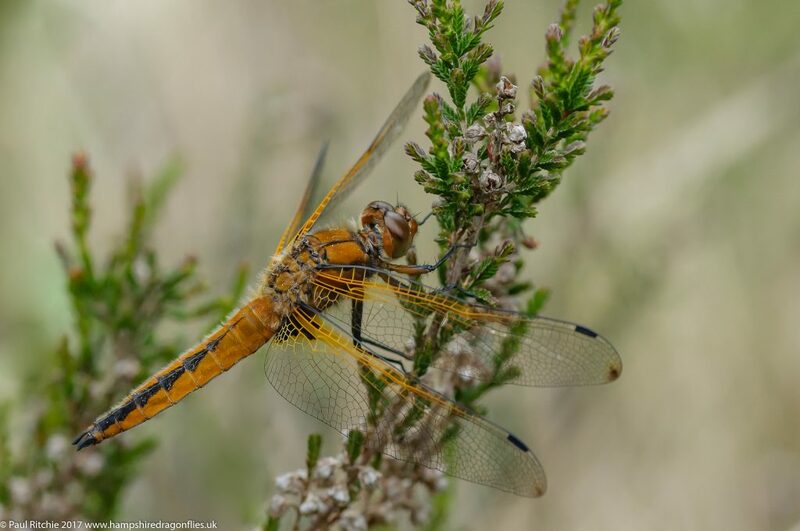 The dragonflies certainly didn’t disappoint with a teneral Four-spotted Chaser rising from the scrape on the way in, and at the pond proper it was a scene of frantic activity. 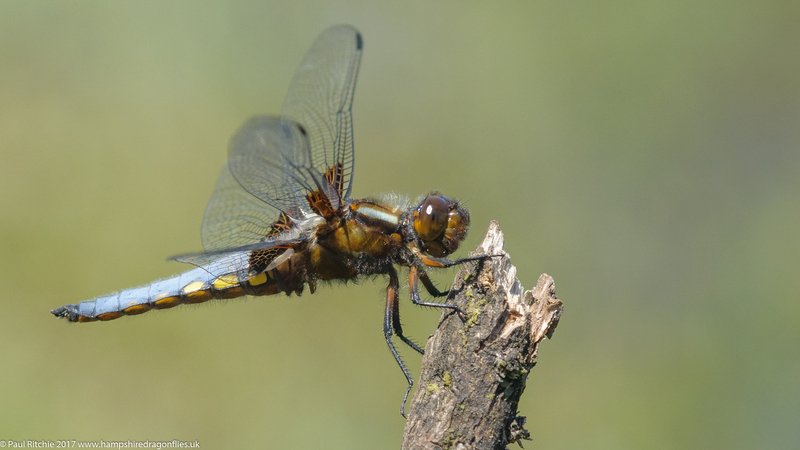 Four-spotted and Broad-bodied Chasers, a male and female Emperor, a male Downy and the usual smattering of Large Red, Azure, Red-eyed, Blue-tailed and Common Blue all staking their claim for territory. The chasers predictably ruling the roost, constantly pestering the Downy while the Emperor remained aloof; the prefect among the bullies. 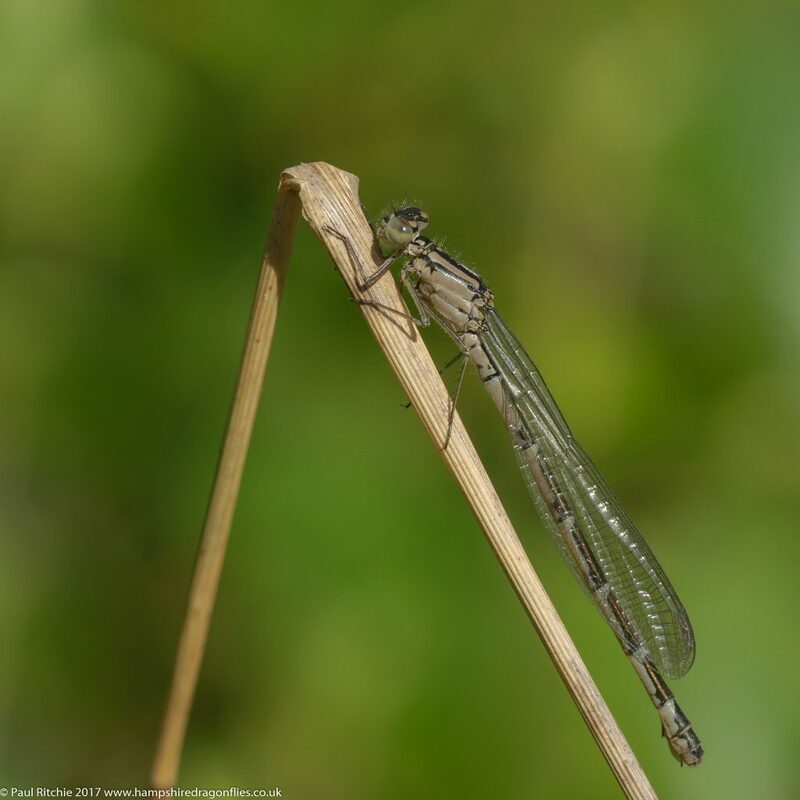 Despite the recent rain the pond is showing it’s usual signs of drying out along the fringes, the protruding underlying grasses making in-flight photography hard work trying to keep your subject in sight among the busy background. I wanted in-flight time with the Downy, but the constant bullying by the BBC’s put pay to any predicted path, so I attempted the impossible by trying to grab a shot of the melee. Although not perfect it does give a good impression of the activity. When they’re not engaging in tumultuous behaviour they find a suitable perch to survey their territory. 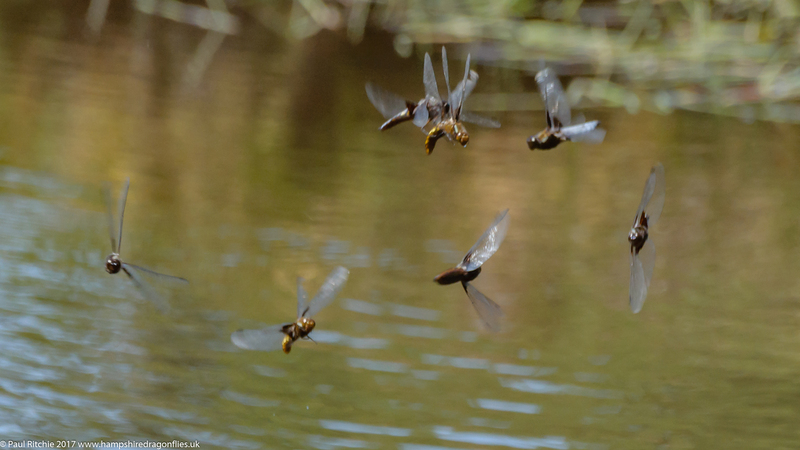 The damsels were all going about their own business undisturbed by their larger cousins. However today was all about taking in the tussles, the frequent pairings and the subsequent ovipositing of the Chasers and the more purposeful flight of the Emperor. Last good day of the weekend and me somewhat frazzled after a night of partying, Sue & I headed up to Bramshill to grab some fresh air. At the small ponds the usual candidates patrolled, including an occasional Hairy. 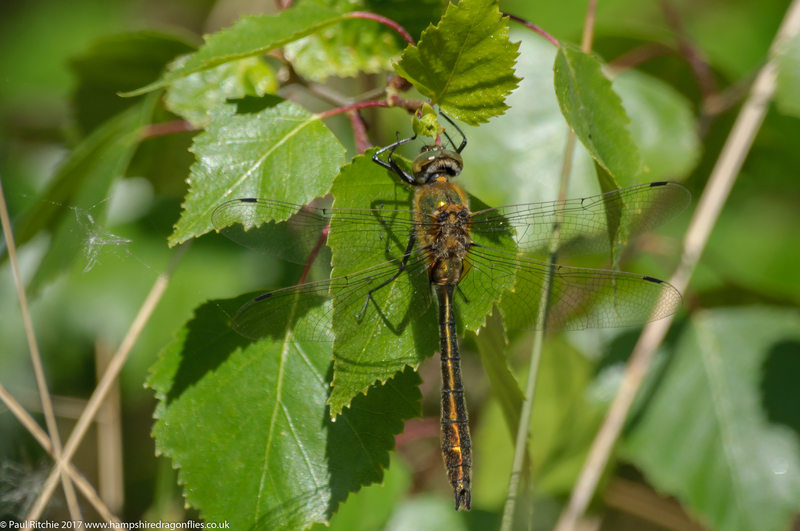 The pond clearing has already overgrown to a challenging jungle at least offering safe retreats for the many teneral and immature Odonata, with several Emperor, a couple of Broad-bodied and a fair showing of Four-spotted. 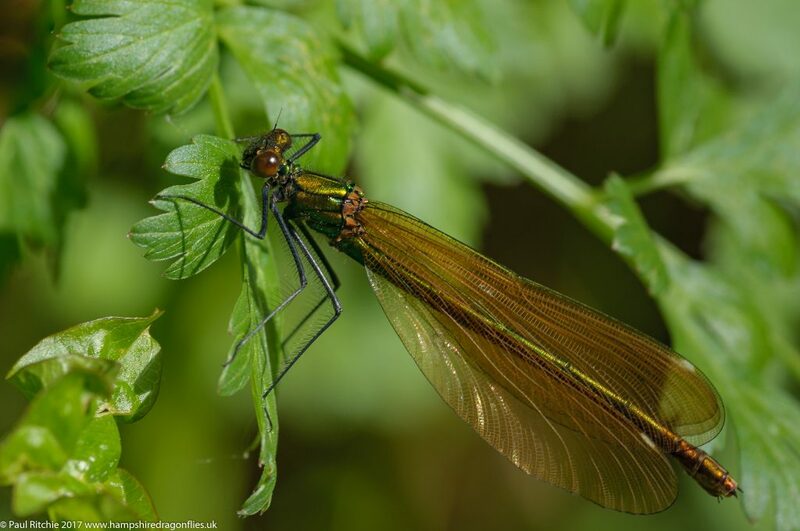 Beautiful Demoiselles decorated the entrance to the path while along hawker alley the tenerals were rising to the trees or foolishly landing on the gravel path. So far only Four-spotted patrolling the waters edge. At the far end of Long Lake more Four-spotted, an Emperor and a difficult to pin down male Hairy gliding effortlessly in & out of the Bulrush. Nothing much in the (overgrown) clearings so we headed across the other side where we bumped into Alex Berryman; a young and enthusiastic ambassador for the BDS. 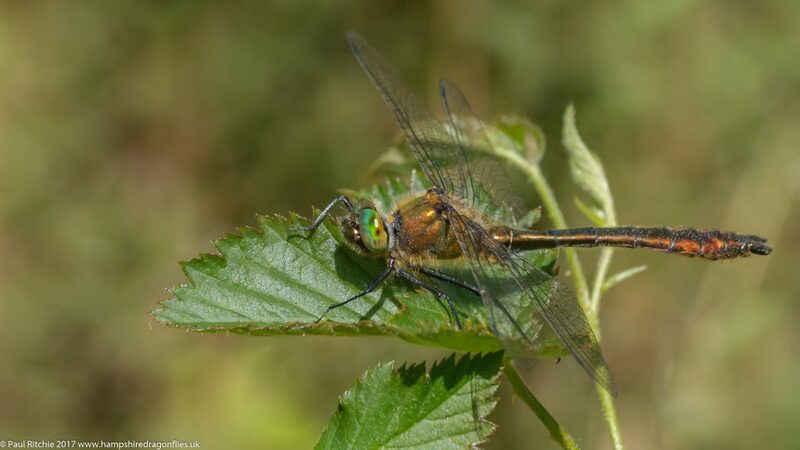 After initial greetings he pointed out a thoroughly-chilled male Downy Emerald, quite content to sit there for the camera. At last an opportunity to warrant the trip. Not many opportunities, and in-flights are even harder work with a hangover! I finished the day with a pair of Common Blue. 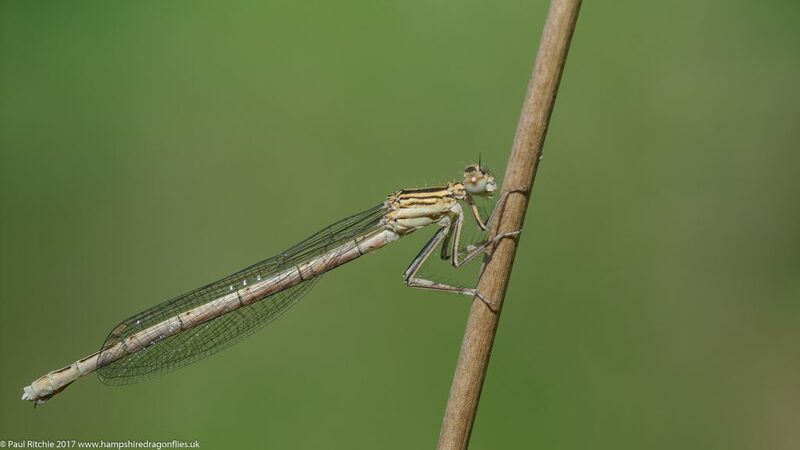 A friend of mine had Keeled Skimmer and Scarce Blue-tailed a couple of weeks ago in Cornwall, another friend had Keeled Skimmer at Cadnam Common Monday and SBT were seen in numbers on Winfrith Heath in earlier in the week. Sounds like a plan? 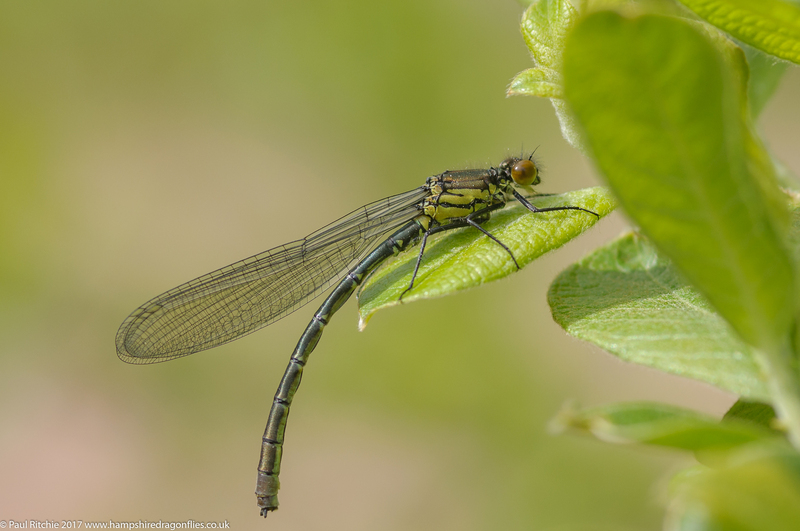 I’d already decided to visit Latchmore if the conditions were right this week, and Wednesday looked promising for the morning so with early sunshine, high temperatures and little wind I arrived shortly after 9.30am eager to dig in to see what I could find. 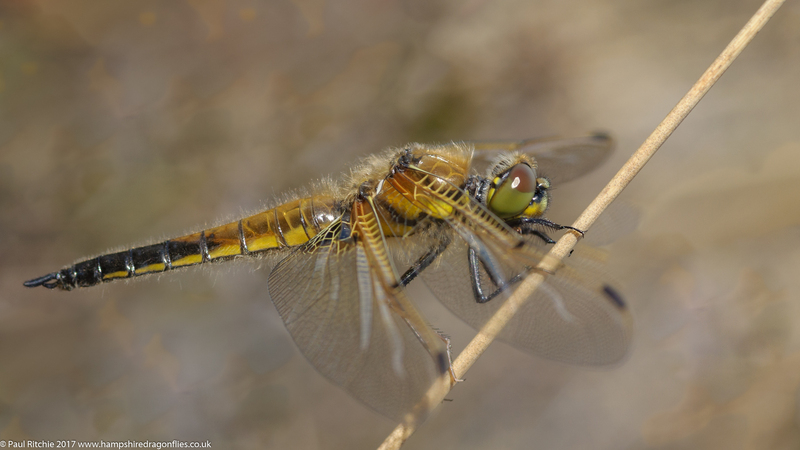 Nothing on the walk in and just as uninspiring at the key area until I caught a glimpse of a teneral, taking a couple of quick shots with the long lens before my only damsel so far caught the breeze and disappeared from view before I could change to macro. Not the best opportunity and a tad frustrating to see the joy disappear with no further sightings despite a fingertip search which was worthy of the authorities. Nothing. Zilch. Ouch! 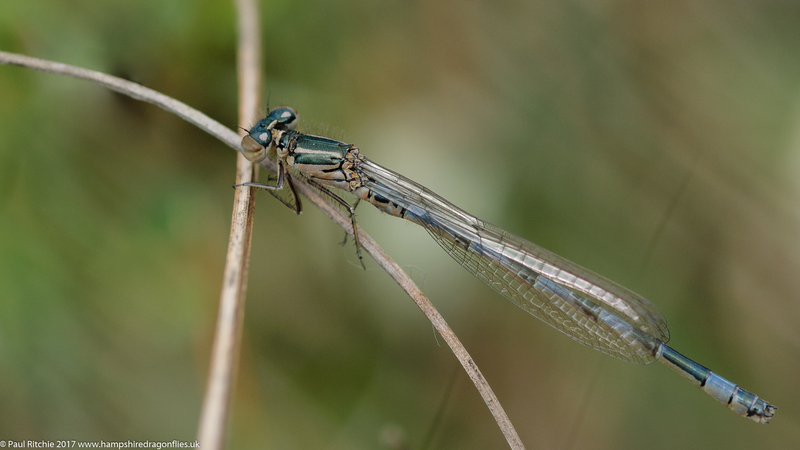 Still, a teneral male Scarce Blue-tailed is not to be sniffed at, despite the hay fever. I took a walk along the parallel flush and uphill following the stream to Gypsy Hollies, surprisingly dry and navigable despite the recent rain. 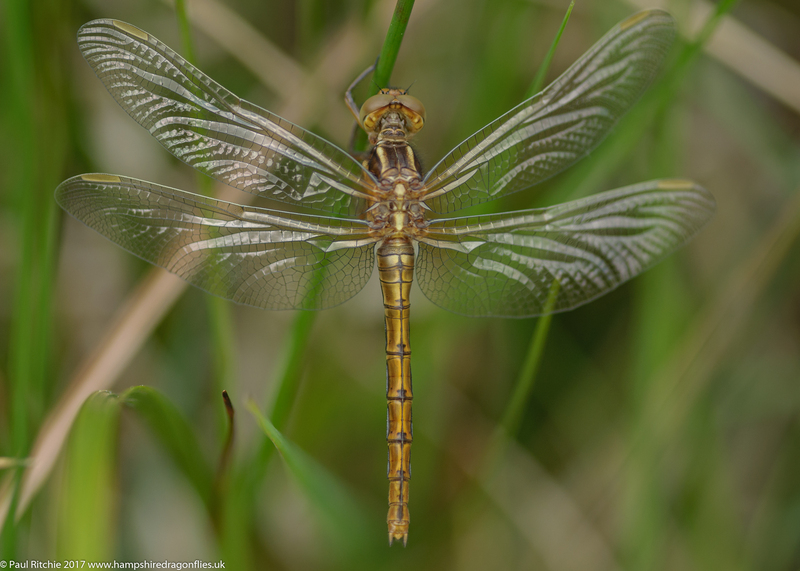 I did however catch sight of a hoped-for Keeled Skimmer among the mire. 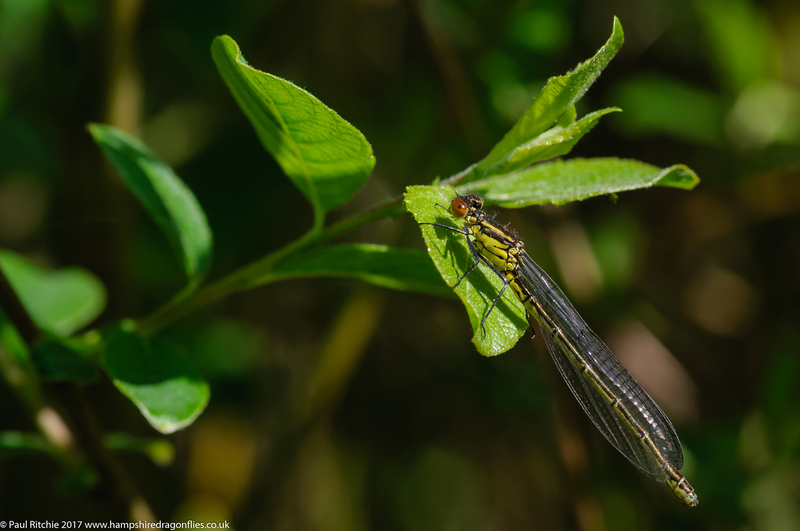 Shortly after I noticed a teneral rise from the mire with a distinct blue tint which, at this location, had to be a Southern Damselfly. What a result! And what a chase, straight into the boggier sections of the mire. Just the one, and the best I could manage before he decided to rise uphill way out of sight and reach. Despite my renewed faith the only other sighting I had in the area were a pair of Large Red, and even they disappeared. Never mind, there were plenty more along the main stream along with several Azure, also making use of the temporary pool replenished by the recent rain. 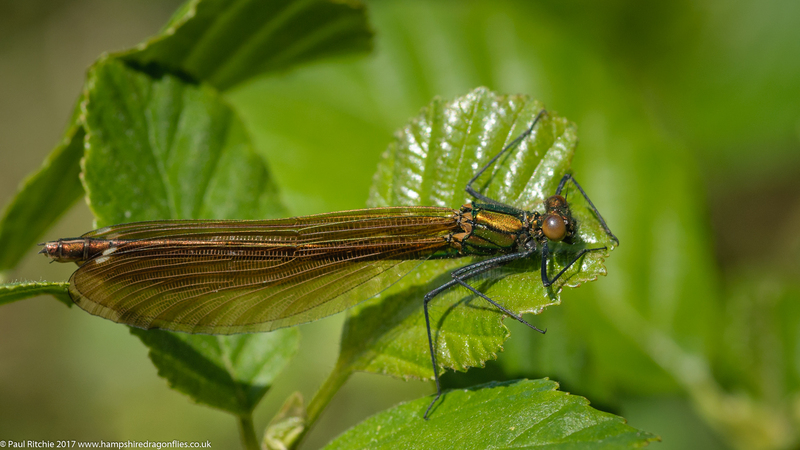 Other than that a lone male Broad-bodied Chaser held court over the boggy pool to the north of the stream and a smattering of Beautiful Demoiselles along the main flow were the only other Odonata present during my four hour foray. I decided to pop over to Troublefield, bumping into Paul Winter in my favourite meadow. There were the usual Scarce Chasers and both Demoiselles present and a female Broad-bodied who naturally gave me some exercise. After disappearing into the other meadow for a while Paul returned and mentioned he’d just spotted an immature female White-legged damselfly near the gate. Having exhausted both myself and all other options she rounded the day off nicely. Four new species in one day? That’s a good day in anyone’s books. The usual weekend site of preference in May is preferably somewhere peaceful to avoid the crowds, and with the sunniest aspect to the south-west Town Common looked the best choice. We’d arranged to meet Doug, eager to get out on his first excursion this season. 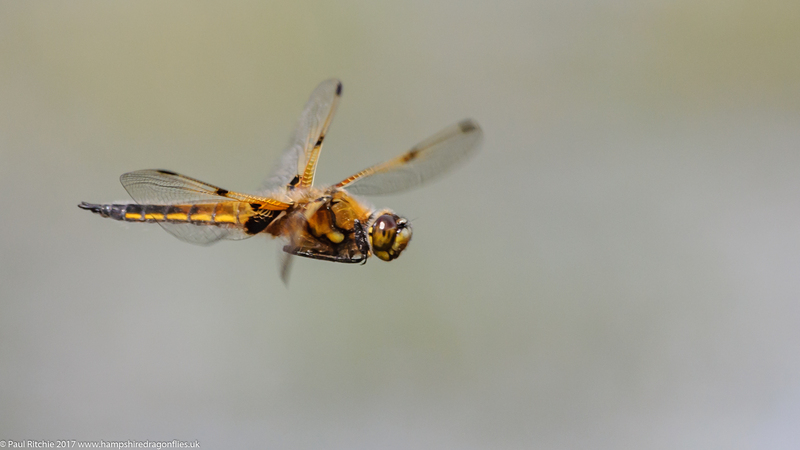 The excitement of finding a Downy patrolling the first pond was intoxicating and we spent a short while hoping to practice some in-flights, however the Downy didn’t stay around for too long in the presence of the bullying youthful Four-spotted Chasers. 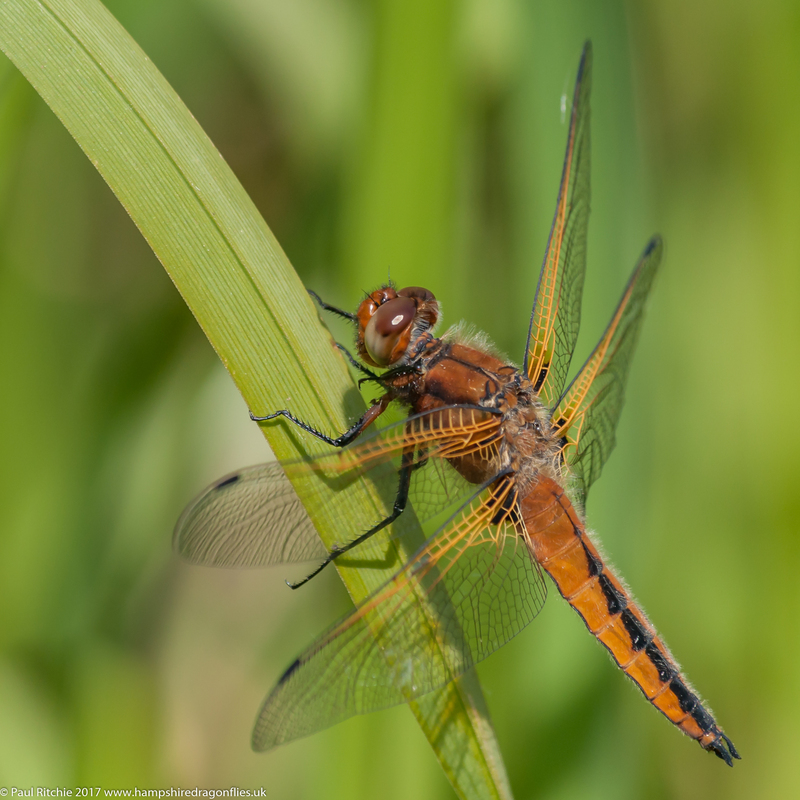 The other nearby ponds offered nothing new over-water however the heath had some Scarce Chasers. Shortly afterwards we had our first Emperor sightings this season; three in total, all feeding high along the treeline and occasionally perching in the heath, yet every attempt to locate them was thwarted by them having far better stealth than us. At one point, having seen a female go down, I questioned my own observation until she rose right under my nose to provide a rather splendid display of her new-acquired aerobatics above our heads. Two more around the third ponds surroundings who again were adept at disappearing completely, so we walked a circuit to take in the furthest pond in the hope we’d see a Hairy. We didn’t, so back to the first pond to sit down bank-side and attempt a few in-flighters to clear away the cobwebs. The Downy had returned and put in an appearance every so often before being driven off by the chasers. Having exhausted all options by 2.00pm we decided to move on to Troublefield. 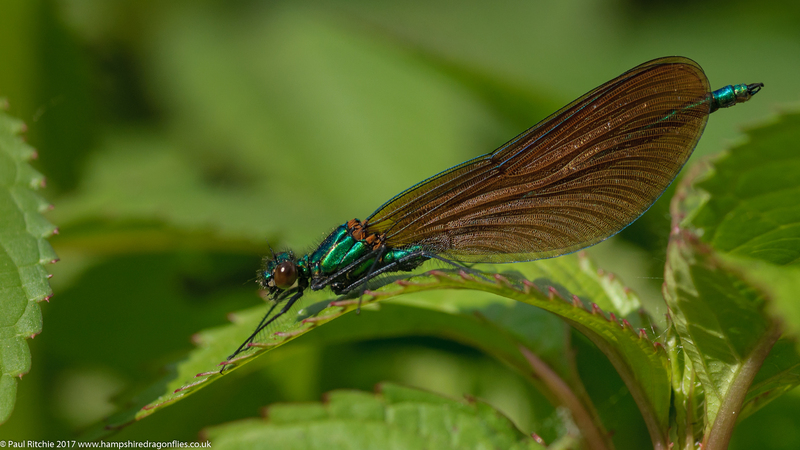 The meadows weren’t as busy as Thursday but still provided a wealth of Butterflies and Demoiselles who, after a day of sunshine, were mostly resting out of sight while those that remained gave good chase. 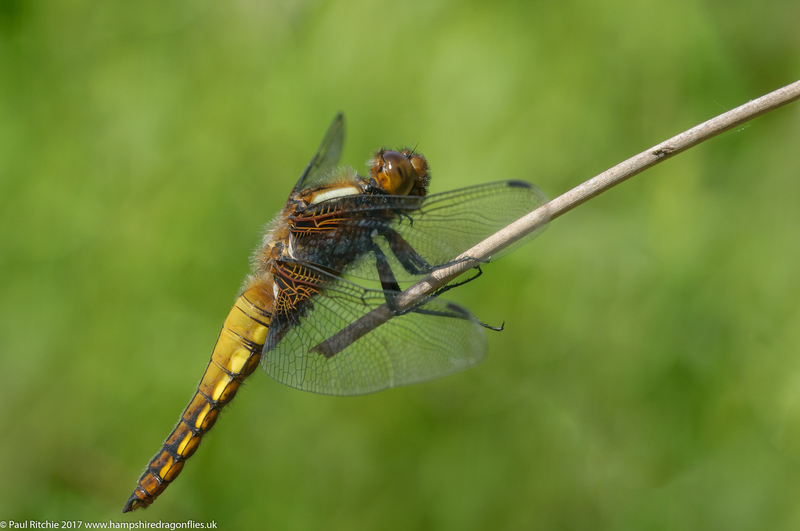 A couple of Scarce and a couple of Broad-bodied Chasers gave us more than enough exercise but I was determined to lock on to one of the latter, eventually having to approach from ground level and peer through a gap in the grass to grab this shot. We moved to the other meadows where Doug found his Hairy, a male patrolling the back treeline, happily resident in his food-providing chosen micro-climate until we arrived. 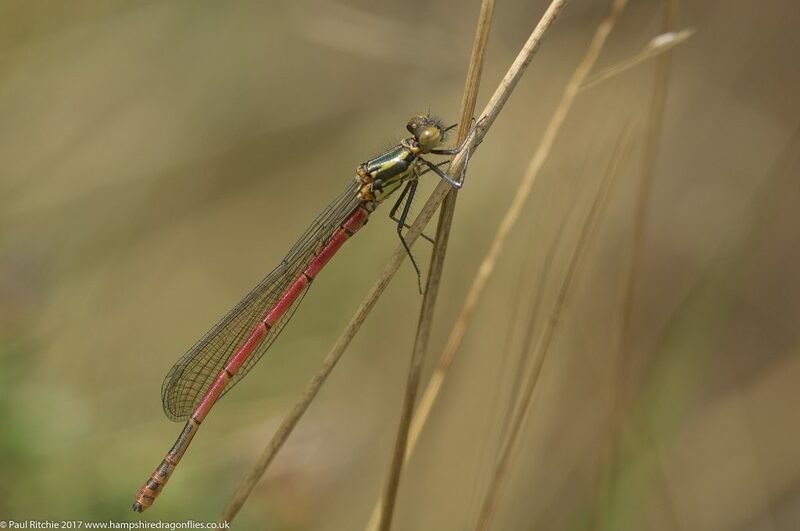 Damsel activity was once again centered around the far end pools with a good showing of , Azure, Large Red and both Demoiselles. No Emperor or Golden-ringed present here today, however it shouldn’t be long with most mid-summer species on the wing. We couldn’t relocate the Hairy either, so I finished the day with one of the rarer Large Red female variants, the melanotum form. We’ve had some rain at last! Shame it had to coincide with a visit from Dave Clay, a mate down from Derby whom I first met at Chartley Moss some years ago. He was staying near Ringwood and Thursday was the first suitable day this week. At Troublefield the impact of those showers was immediately noticeable with healthy growth and soggy patches underfoot. 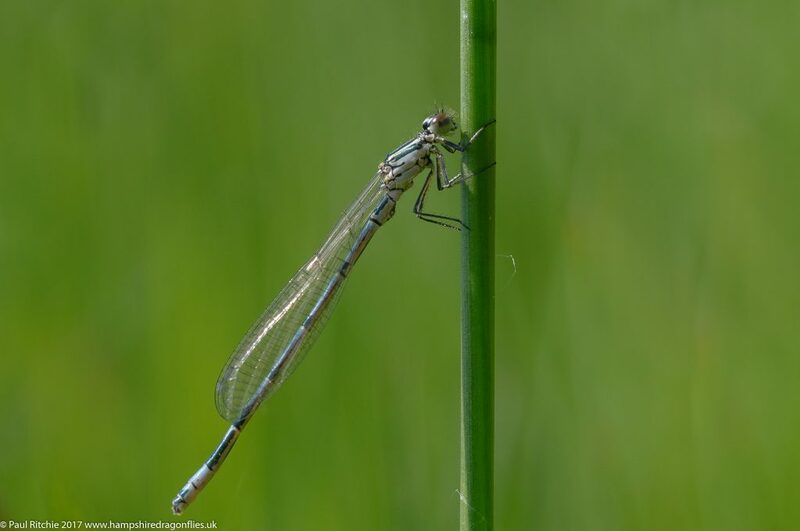 First to show were a couple of Beautiful Demoiselles swiftly followed by a selection of Spring Butterflies, including several Brown Argus, Small Copper and Common Blue. At the riverside Banded Demoiselles joined the cast and most welcome was this season’s fresh batch of Scarce Chasers, resplendent in their vibrancy. All looking their best when the sun peeked through, and just as agreeable under light cloud. 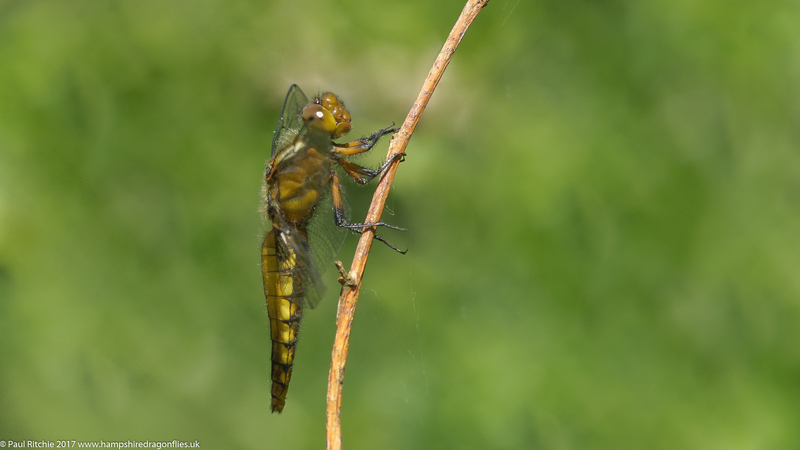 Although the Cuckoo Flower was fading the emergence of new growth filled the meadow with suitable feeder insects, enough to attract a Broad-bodied Chaser finally close enough for an opportunity. Having a friend around who is more of a generalist is satisfyingly educational, allowing a greater appreciation of other flora & fauna present in this fabulous water meadow. The only downside is the occasional lack of focus by yours truly in an effort to remain sociable. We decided to check the south meadows where Large Red and Azure were present in greater numbers; preferring to stay near to the ditch which resembles more of a pool towards the far end. A pair of Azure refused to offer a satisfying stance other than a character shot – a trend which has resurfaced recently. Except for a couple of pockets these southern meadows are better for Butterflies than Odonata this early in the season so I decided to introduce Dave to Sopley Common and Ramsdown. By now the clouds were dominating and there was a noticeable chill approaching. 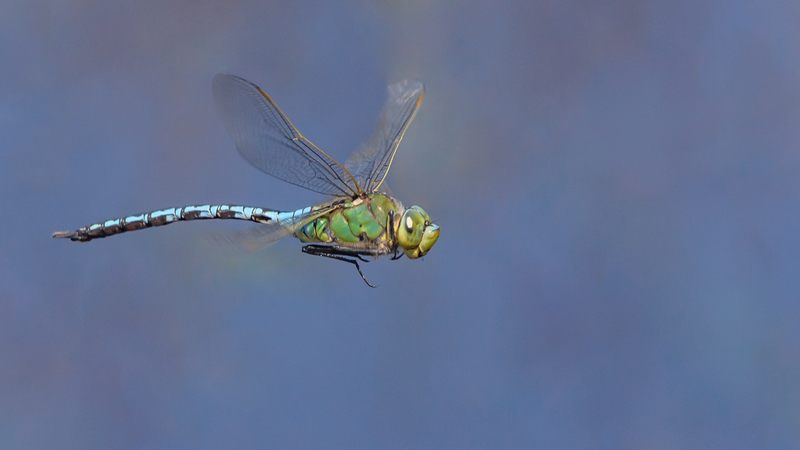 At least there were a few chasers holed up in the heath which made for a nice change of background. We didn’t see much after that, however it was past 3.00pm and the view from the hill didn’t promise any more sun heading our way. Still a satisfying few hours in pleasant company and nature provided. After dining out on Somerset for four days I needed to get out again and with moderate winds, occasional showers and those all-important sunny intervals another visit to Bramshill was needed to get away from it all. 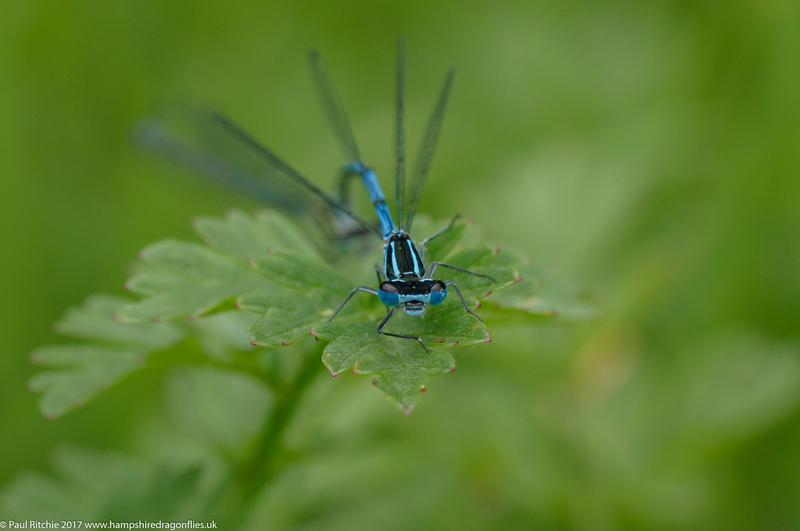 No Downy along the first path this time but the Beautiful Demoiselles were showing well, skittish as usual, filling the glade with bronze. 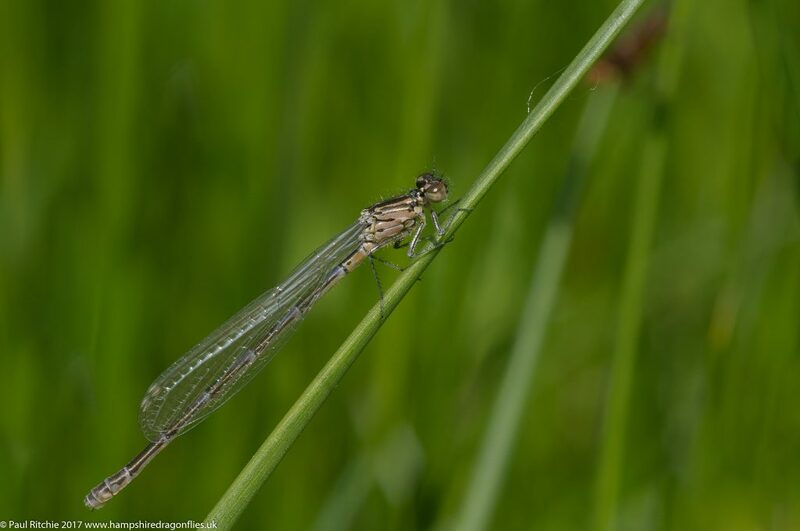 The ponds were likewise empty except a few damsels brave enough to challenge the breeze. 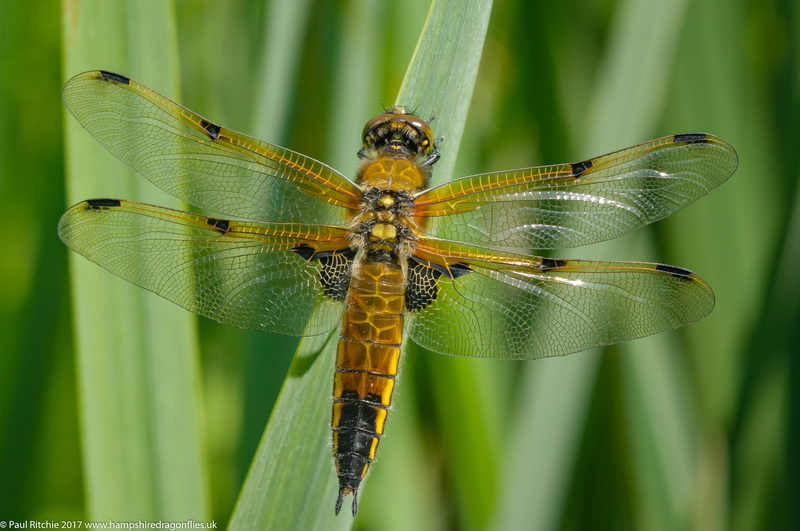 The pond clearing had a few Four-spotted Chasers taking time out and I had the briefest glimpse of this year’s nemesis, the Broad-bodied Chaser. I had another fleeting glimpse later on but couldn’t relocate either of them. 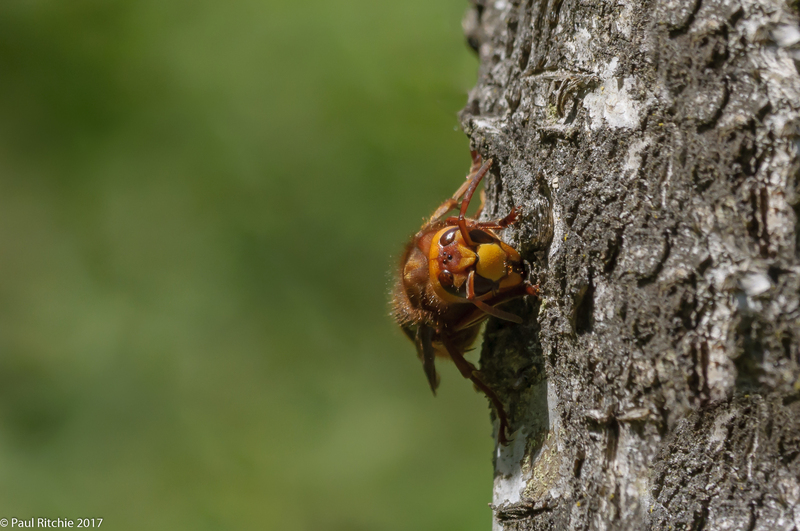 The scrub also had a rather good showing of Grizzled Skippers and on the way out a European Hornet was busy inspecting the bark of the one of marker trees. Towards Long Lake we caught sight of a couple of fresh Four-spotted Chasers letting the wind take them and surprisingly choosing to stay low out of the breeze. 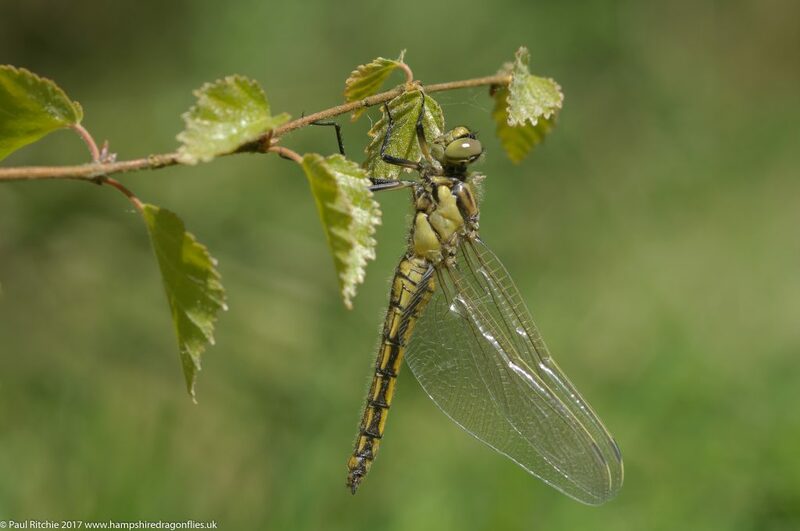 It was along hawker alley that Sue spotted what turned out to be a fresh female Black-tailed Skimmer, rather early as has been the way this season and a delight to see. Again staying low she landed perfectly of a small branch allowing me a little indulgence from ground level. 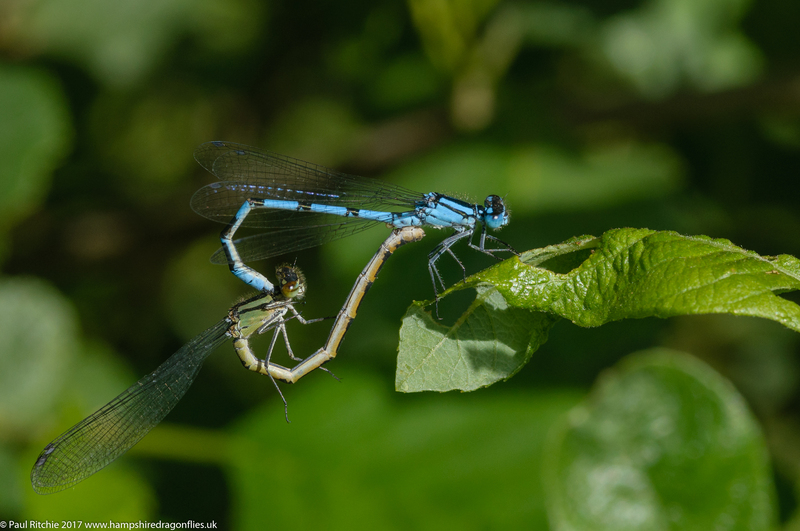 After this unexpected showing I said ‘Downy next then’ and within one of the scrubby gaps I disturbed a young male who rose briefly and thankfully landed unusually on the same sapling, breathing rapidly through his abdomen in an attempt to gain the energy to escape this interloper. Beyond the gate Sue spotted a male Hairy get up and land in the same bramble bush and for the life of me I couldn’t spot it. I did when he rose and flew off though! On the walk to the central ponds we spotted a couple more Downy choosing to perch high and at the stream the second Broad-bodied teased while the clouds drew in. Dark clouds with the threat of rain, and everything fell silent. 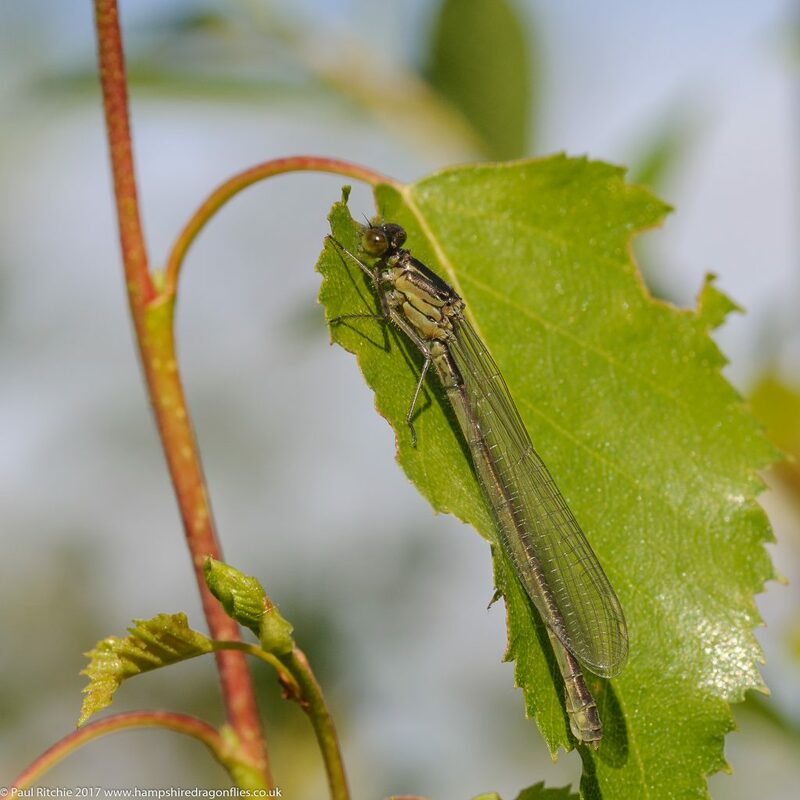 We didn’t see the sun again for some time, it’s presence prompting a small level of activity at damsel corner before once more disappearing under grey. The temperature had noticeably dropped too and I we were both alarmed at how much time had passed. It had been three hours since the Black-tailed Skimmer and only a few Damsels to show since the Downy. Peaked way too early, but I’m not disappointed. As I’ve said on many occasions so long as you get that one shot everything else is a bonus. 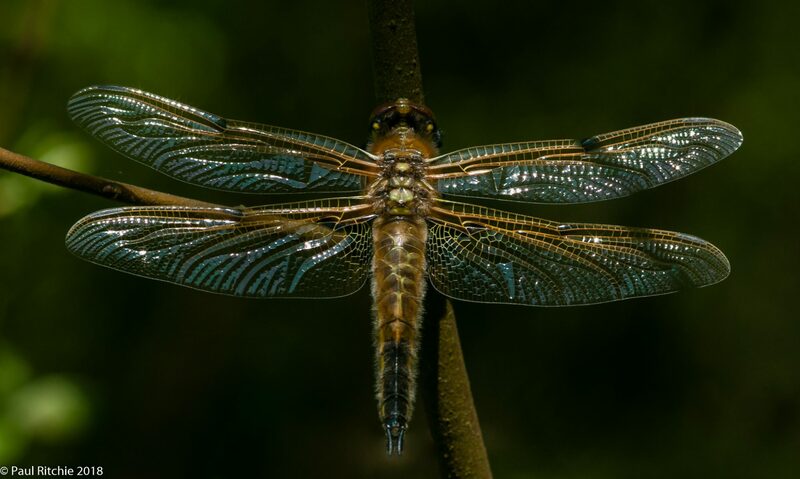 May is the month when there’s a bounty of new-birth, and new seasonal discoveries in the dragonfly world. Despite an early season diversity and numbers are still local, with the best showings at the places where nature still feels like it should be. On Tuesday I called in at Troublefield. The Spring flowers have yet to compete with the nettles but once the sun came out a wealth of butterflies and hundreds of micro-moths provided some entertainment. 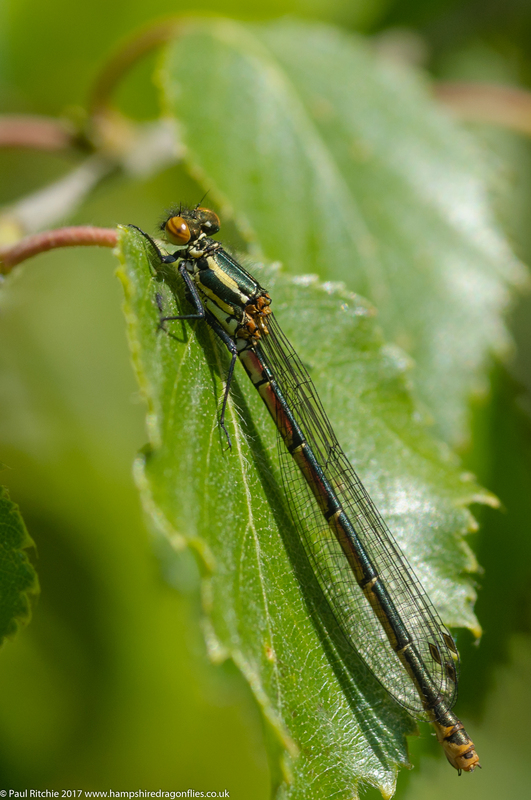 Dragonflies were still few & far between with a few Beautiful and my first Banded Demoiselle of the season. Fabulous to see with those ‘flashing’ wings.. Only the one, and in the meadow not usually my first choice this early in the season. Shame about the leg, but as it was the only one present it would have to do. Sadly the remainder of the day fell short, with only a few stray Azures, Large Red and Four-spotted Chasers present at Town Common. Very disappointing. but these days are to be expected. Making the most of the sunniest day of the year so far I drove to Shapwick Heath. 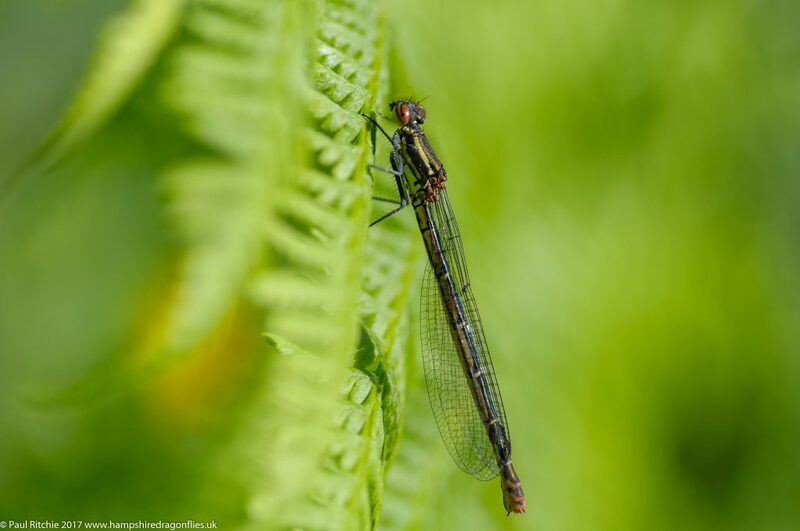 As usual the first opportunities arrived just inside the gate with dozens of damsels among the brambles and nettles along the bank. Shortly afterwards I had my first Hairy opportunity. Now I could relax. 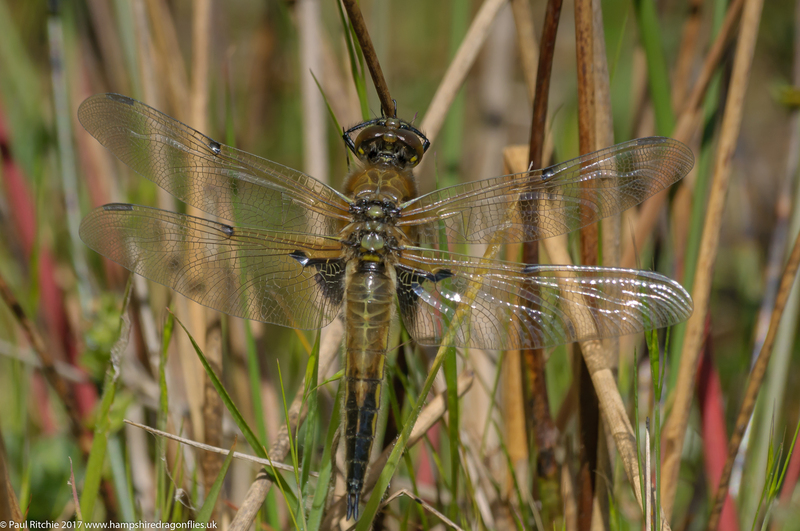 Next to make an appearance were my first Scarce Chasers of the season; always a pleasure to see. I took a walk down the Sweet Track to the top meadow and spent a long while around the margins filling my boots with damsels. Azure, Variable, Common Blue, Blue-tailed and Red-eyed all present with Azure being the dominant. Being absent from S. Hampshire the Variable were what I was really after, especially after finding a rather stunning young female last year. The Levels are one of the best places in the UK to experience these relative rarities and familiarise yourself with the subtle differences. I stood and watched for differences in flight and behaviour and after a while became reasonably confident to pick them out from the throng. A mixture of mature and immature were occupying their time feeding up for the main event. A pair of Blue-tailed however were busy making hay while the sun shone. 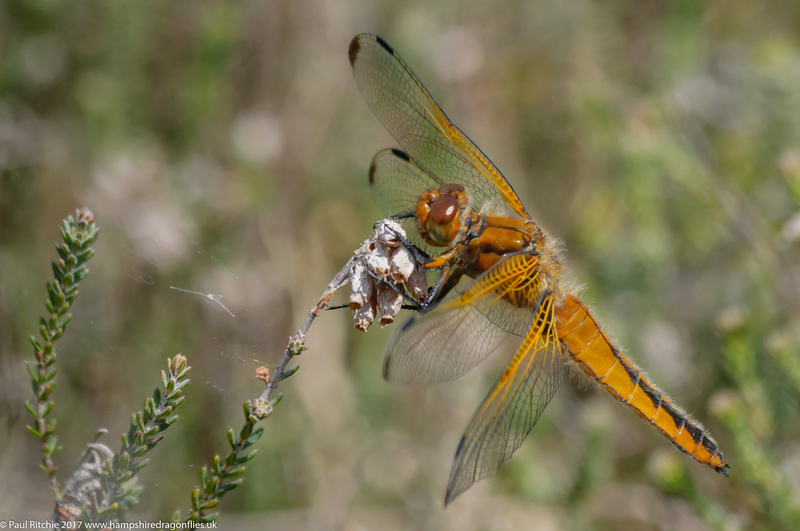 Among the reeds I caught sight of a splendidly-fresh female Four-spotted Chaser; perfect against the green. They always look their best when fresh & new. A fabulous afternoon which passed by all too quickly. Despite the four hour round trip it’s definitely worth the journey. One visit per season is never enough. A promise of fine weather in the afternoon prompted Sue & I to take a late drive to Bramshill. We met Mike on the approach road who gave us a report which promised a productive afternoon. With news of Hairy on the wing we headed straight for the ponds and were waylaid on the approach path by a hunting Downy who thankfully offered the first chance of the day as he perched low on a sapling. Sure enough the ponds did produce fleeting intermittent glimpses of a male Hairy, and another in the clearing near Tarn Pond. Neither stopped to perch or stayed around but seeing them brought the yearly count to nine species. 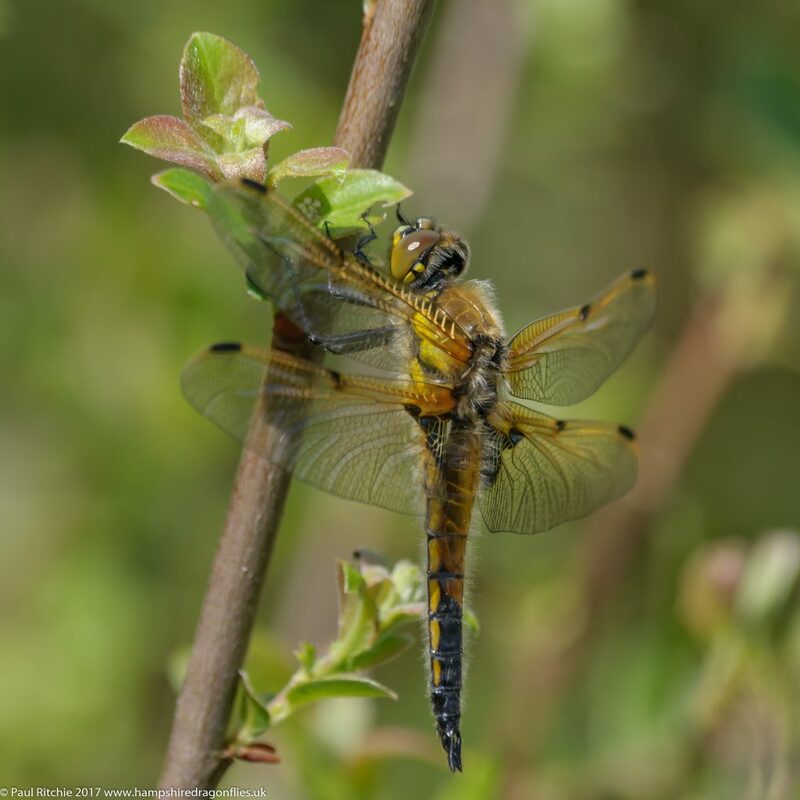 At Long Pond the first Four-spotted Chaser rose from the reeds to the treeline and the path provided glimpses of two more Downy. 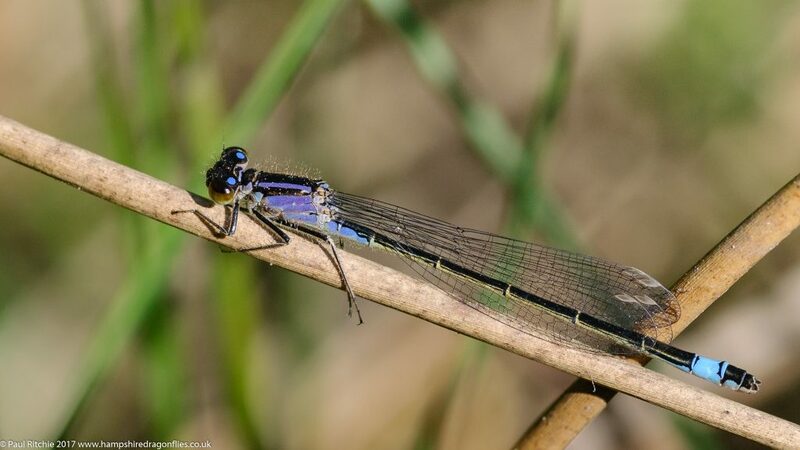 The water has yet to see action but the surrounding scrubby banks provided more than enough damsel action to satisfy, including a visit by a female Beautiful Demoiselle. 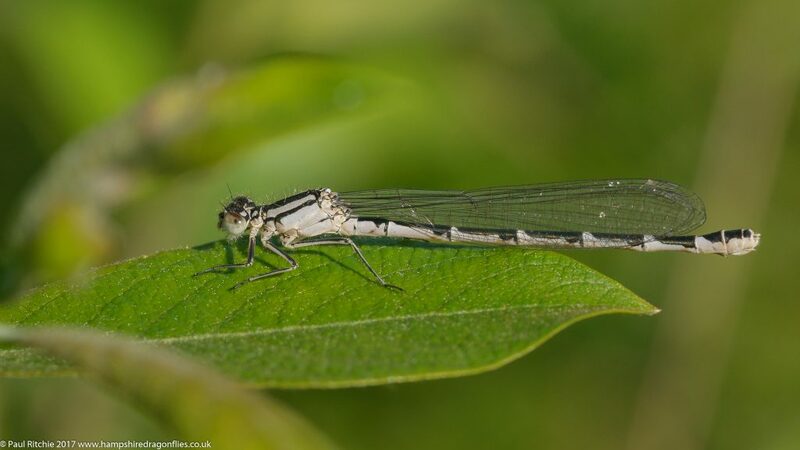 A skirt of the lake revealed the spectacular sight of dozens of tenerals rising to the trees including another Four-spotted which I disturbed while attempting to photograph a Common Blue. The far corner with it’s mix of flora and reasonable shelter had the most action with damsels rising in such numbers as to rival Somerset levels (pun intended) with dozens of Azure, Common Blue, Large Red, Blue-tailed and Red-eyed , so I decided to camp here a while and make the most of it. 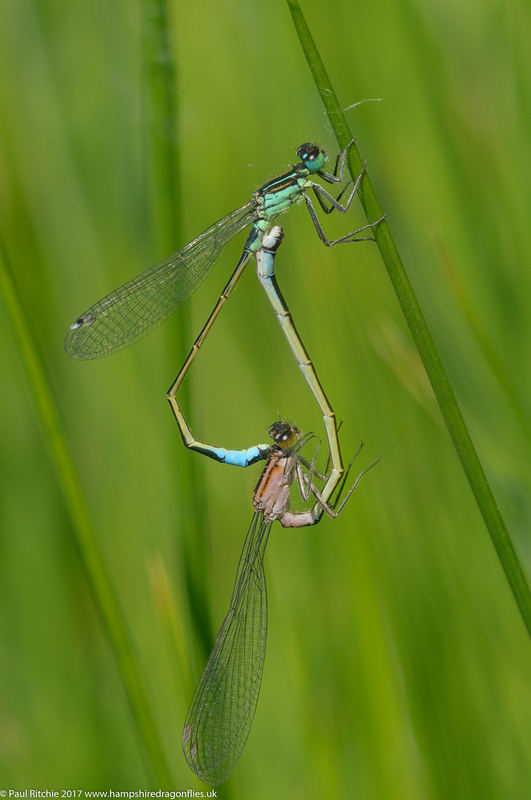 There’s something fascinating about the variety of colours presented by immature damselflies. Arguably there are none more variable than immature Blue-tailed females, which were all making an appearance today with some more approachable than others. While they’re maturing they are quite-rightly nervous and dealing with such delicate subjects takes stealth, respect and a whole lot of patience. Thankfully this is the best time to photograph the Red-eyed; fond as they are of perching flat on a Lily pad. Choosing an elevated leaf is an altogether drier experience for both of us. 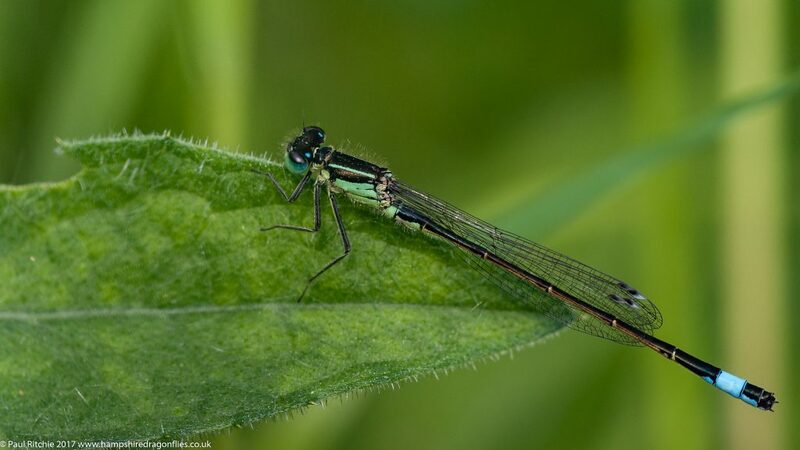 A few years back when I was photographing butterflies I noticed that they would start to roost around late afternoon and it’s usually the same with damselflies. By 5.00pm they were going to ground so I bagged a final Common Blue before leaving them to rest. 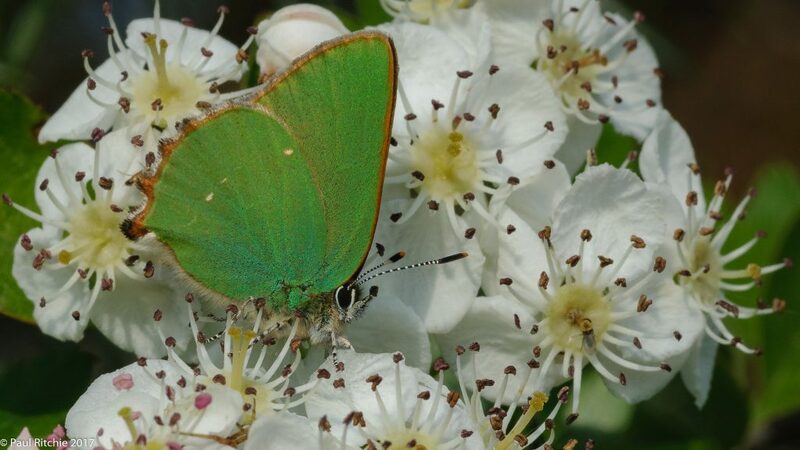 My theory on butterflies was promptly put to rest a short while later when we noticed a bevy of fresh Small Copper and Green Hairstreak feeding on the May blossom the other side of the shore. After this most welcome interlude the clouds started to draw in gradually dropping the temperature so we too called it a day. With a count of nine species it was just what we needed, the irony being if I’d have waited until now before going out this season I could have bagged all I’ve so far seen on this one day. In true Bank Holiday fashion the weather showed improvement once the weekend was over, with Tuesday offering a prolonged session of sunshine with reasonably calm wind. Nevertheless I had to wait until the afternoon before the sun made an appearance, so I decided to begin at Troublefield. 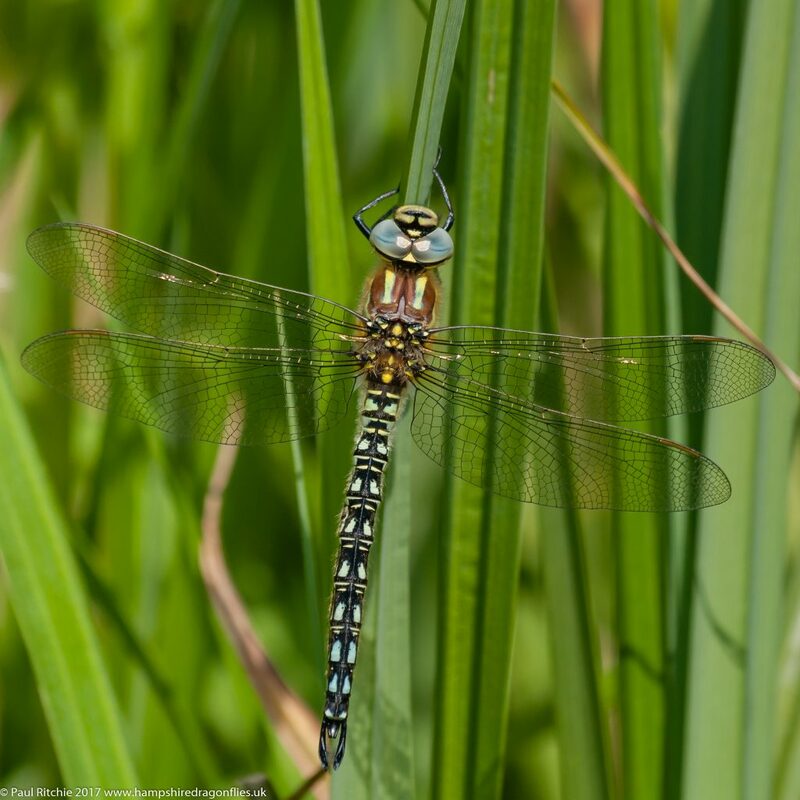 Due to the unusual dry April these usually prolific meadows had yet to produce a decent plant growth, let alone any odonata. The Cuckoo Flower is fading fast and the Nettle is the only foliage showing significant growth. 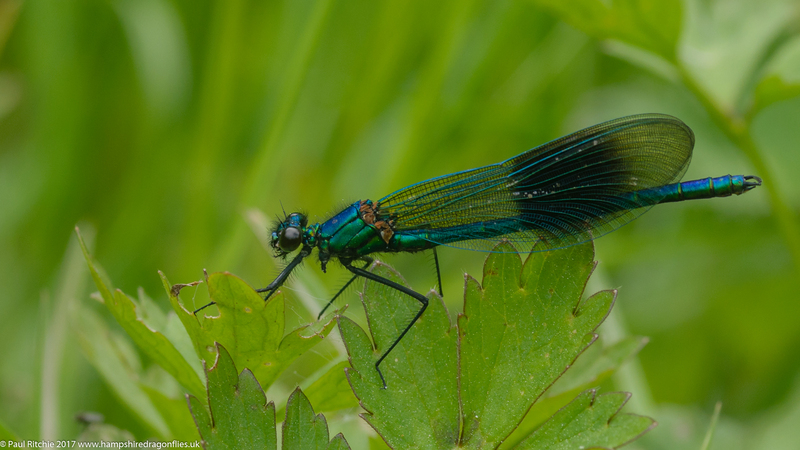 After a good search of both meadows I did eventually find a male Beautiful Demoiselle towards the end of my visit. Ramsdown next and a more substantial search still failed to produce even a Large Red so I continued on to Town Common. A most welcome unbroken spell of sunshine at 1.30pm brought forth the Large Red with some even venturing over water for the first time this season. 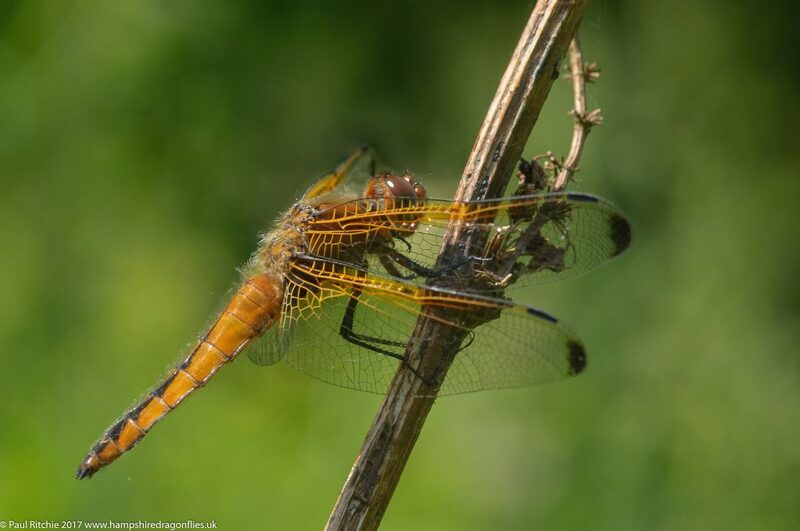 After I busied myself with these I noticed a fresh Four-spotted Chaser rise ahead of me, which I pursued and almost pinned down had it not been for a comically-placed hole which completely ruined my stealth. I didn’t get another chance as it flew out of sight behind a bush and despite spending a good half hour I couldn’t relocate my quarry. 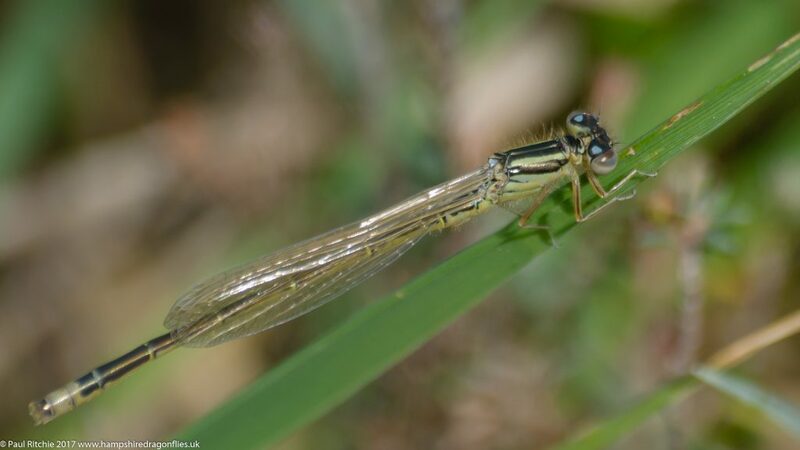 This species rarely emerge singly so there had to be more and eventually I spotted another at the adjoining pond. At least I didn’t encounter any more holes in my pursuit and eventually was able to approach close enough to switch to the macro lens. Thank you then Town Common for redeeming yourself and providing a worthy visit. 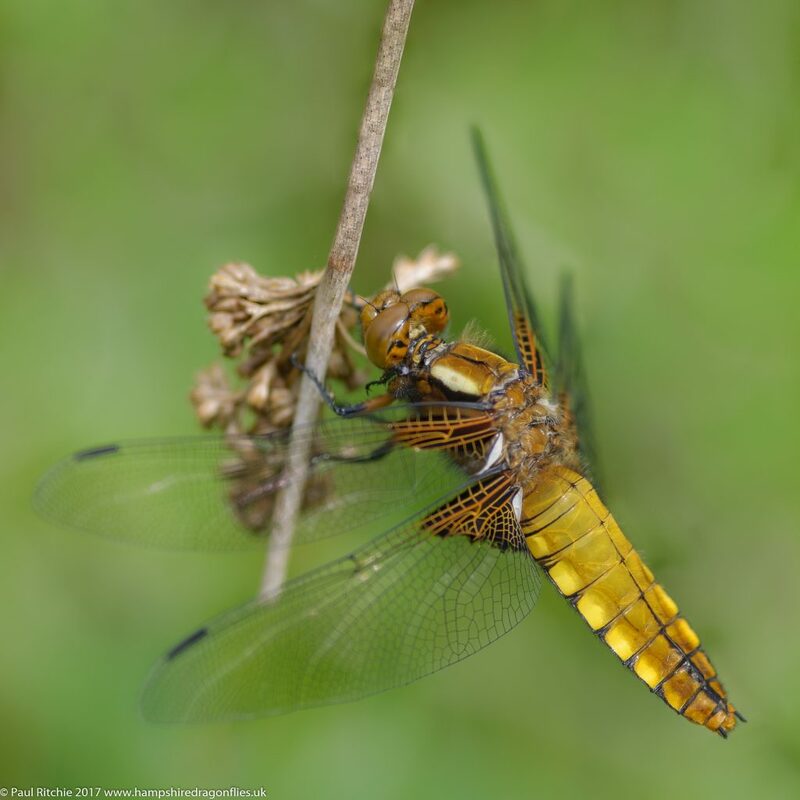 Yes, it would’ve been nice to find a Broad-bodied Chaser, an Azure.or even a Hairy, but I’ve learned not to be greedy and am more than satisfied to find one decent opportunity in what is still early season. 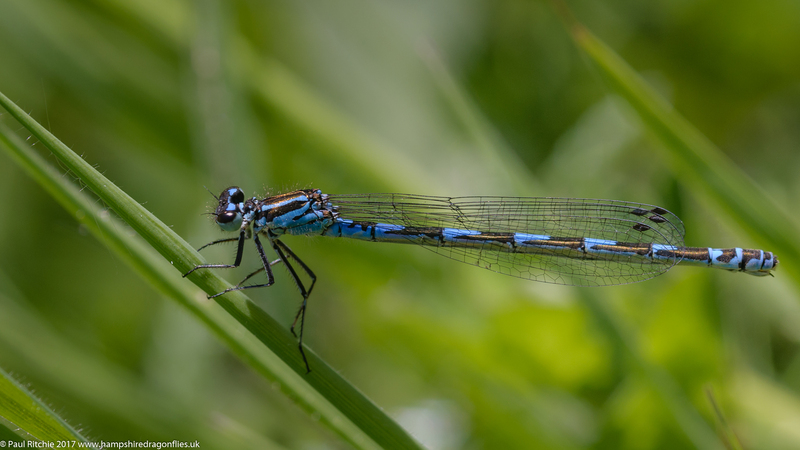 Still not ideal weather for dragonflies down here, and nowhere worthy of too many miles either, so we thought we’d pop into Swanwick to bag a Blue-tailed and see what else we could find. Warm enough, but windy and mostly cloud cover meant we should see something feeding among the scrubbery. There were a couple of Blue-tailed playing over the dipping pond and a few more feeding along the margins with a couple of Azure for company. Those pesky Blue-tailed were not being co-operative and I’d forgotten how quickly they could disappear out of sight, but I managed to pin one down eventually. We took a walk towards the lakes and spotted a Downy hopping between high perches before continuing to the dog pond where I was hoping to find a Broad-bodied Chaser or two, but by the time we arrived the weather had darkened. Two more species added to the season’s list which I’m grateful for. I still need a day to really get stuck in. Hopefully this coming week will provide the right conditions for a mini bonanza. After a week of miserable weather, where the best option would’ve been to travel to Somerset and binge on damsels and a possible Hairy, I couldn’t spend another day in waiting. The forecast for Bramshill looked reasonable on Friday, but soon changed into indecision – something I decided wasn’t going to cut it. We’re going…it’s been nearly a fortnight. It was overcast on arrival, and pretty much stayed that way for the rest of the afternoon with a few fleeting, but welcome, glimpses of sunshine. Hard work; the ponds, unsurprisingly, produced zilch – except Jeff (Geoff?) whom I’d met previously here, among other places. We took a stroll along the south shore of Long Lake expecting to find some tenerals rising, but it was a little too cool and still cloudy. 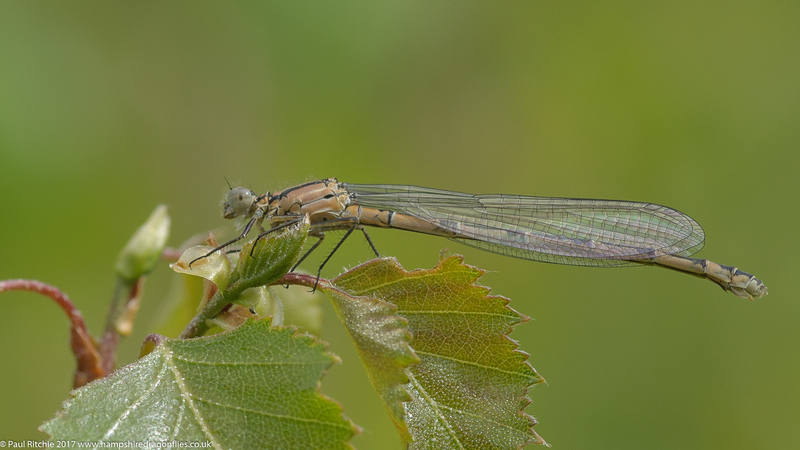 Our saviour was an immature female Common Blue giving me much amusement playing hide and seek behind her chosen perch. On our way back around Jeff mentioned he’d just seen a Red-eyed, and thankfully we found him in the same spot; for once staying put and allowing me to achieve a decent angle. That’s more like it! Species number four this season filled me with renewed hope as we continued exploring Long Lake, but even the scrub pockets were lacking today. So too were the central ponds. Not even a Large Red to be found. By the time we returned to the main track the sun finally decided to put in an brief appearance, and with it the welcome sight of not one, but two Downy Emeralds flying high along the treeline, hunting before the cloud reappeared. Species number five. Magic! We did eventually find a couple of Large Red as we headed back down hawker alley. Just the two? Even the best places have their quiet days. Just prior to this I came across a young Buzzard sat in the shallows. First time I’ve seen a Buzzard taking a bath. Nice surprise though! The weather forecast had already decided we weren’t going anywhere today, but as I woke reasonably early I decided to grab what sun there was by revisiting Durley Mill. 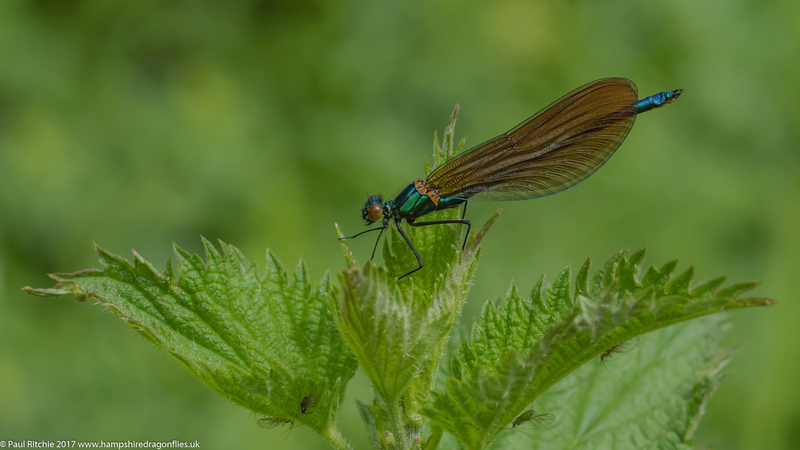 A thorough search of the river bank eventually produced three Beautiful Demoiselles, and the still cool and very windy conditions helped with pinning down an obliging male. 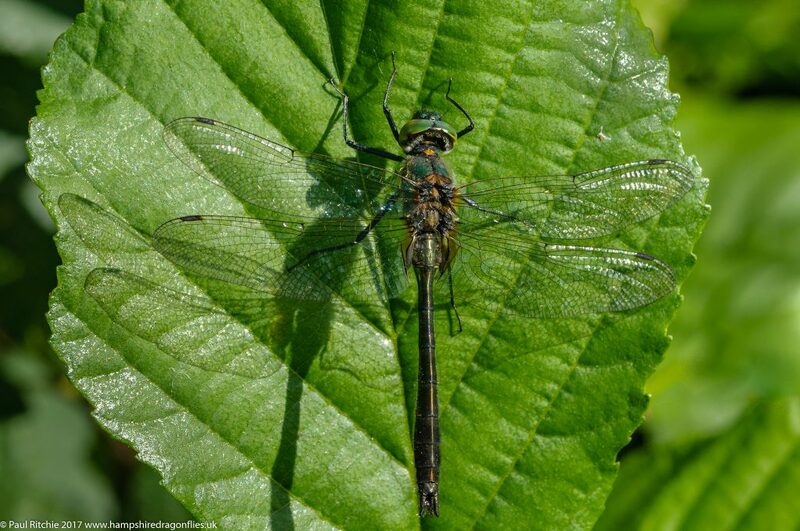 I did say I’d make a return visit, and will no doubt make another over the next month, when they can be seen in greater numbers decorating the old railway path, their shimmering beauty complimenting the dappled light of this wooded river valley. As I write the rest of the Bank Holiday weekend is typically dreary but at least there’s some rain which we desperately need. It’s way too dry out there, and the plants needs watering!